This paper was published in 2012 by the UK Parliament Defence Committee and outlines a possible Smart Power approach to the international communities endgame in Afghanistan. 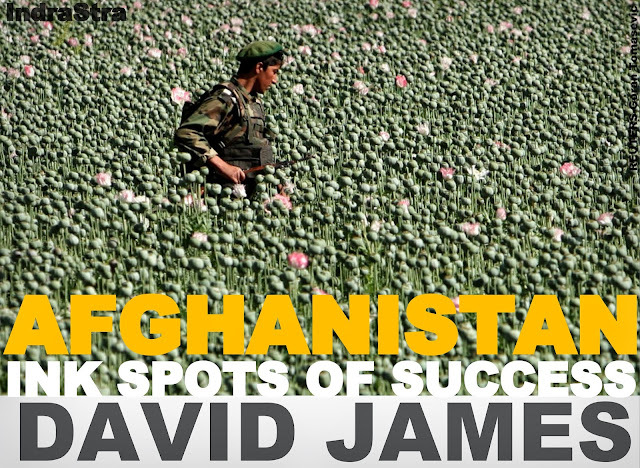 The insurgents in Afghanistan have access to sustainable funding through the control and taxation of opium. The Afghan Government does not. Currently the Afghan Government and the Afghan National Security Forces in particular will continue to be a significant burden to the international community’s taxpayers up until the point we are willing to allow everything we have built at great cost to collapse. By rapidly building and supporting zones of peace and economic growth in the areas least affected by the insurgency we can help the Afghan population begin to pay the tax that will make their government accountable to them and provide the motivation and resources to maintain the Afghan National Security Forces - ANSF. ‘Ink Spots of Success’ argues that supporting the Afghan professionals (who are currently losing their jobs) to lead an economic boom in the most peaceful areas of Afghanistan should be our main strategic effort. This would deny significant ground to the insurgents and create a new politically motivated business community that could become the meritocratic leaders of post Transition Afghanistan. From my own personal experience in the Wakhan Corridor I can attest that these Ink Spots of Success do exist and could grow rapidly but they are under serious threat from negligible funding and the rapid encroachment of insurgents displaced by military operations in the south. Much better soldiers than me have said we can’t win the war in the south, but I believe we could still win the peace in the north. Success in Afghanistan is not and cannot be achieved through the military defeat of the Taliban. It is the building of the viable positive alternative. But what is the alternative and how do we realize it? · Who? – the educated professional elite who have been working for the international community – they are the Afghan antithesis of the Taliban. · What? - the economy is centre of mass for success. The insurgents have access to sustainable funding through the taxation of opium. The Afghan government does not. Building the economy rapidly is critical. · Where? - the most peaceful areas of Afghanistan where the Taliban will have to overextend themselves to operate. · How? - focus strategic resources on the rapid development of Ink Spots of Success where our efforts will deliver the best return on investment, provide a tax base and deny vital ground to the advances of the insurgents. 1.1. Although the international community can legitimately claim steady progress in Helmand and other parts of southern Afghanistan it is progress delivered through $120 billion of military pressure (2011 US spend on military operations). This is more than six times the entire GDP of Afghanistan and equates to $3.4 million for each of the 35,000 members of the Taliban – (based on the 2010 US National Intelligence Estimate). 1.2. This military pressure in the south is not only unsustainable but also destabilizing the previously insurgent free north. 1.3. By focusing strategic resources on 0.012% of the population we are making them disproportionately powerful and forcing ourselves to respond to their agenda. The cost of military operations is more damaging to us than the Taliban themselves and we have willfully achieved Osama Bin Laden's objective of over extending ourselves and bleeding into the sand of Afghanistan. 1.4. If we redirected ‘ just ’ 10% of that spending into helping our few remaining Afghan friends build the economies of the most peaceful parts of Afghanistan we would achieve greater strategic effect faster, smarter and more sustainably than focusing all our resources on killing our enemies. If we can’t help moderate Afghans build a future to fight for and the tax base to achieve it nothing we have achieved in ten years will survive the transition. 2.1. Fundamentally I believe we have got ourselves into a difficult situation in Afghanistan because we've concentrated the vast majority of our resources on our enemies and not our friends. Success is not the defeat of the Taliban it is the building of the viable positive alternative. Our current approach is focused on Hard not Smart Power. 2.2. In 2001 a few hundred Special Operations Force personnel and air power helped the Northern Alliance defeat the Taliban. The Taliban were a spent, defeated and discredited force. The reason that they have become resurgent is because we did not fill the power vacuum with a viable alternative. 2.3. As we withdraw international money and military personnel we need to ensure that we leave something sustainable behind, or nothing that we have achieved in 10 years will survive the transition. 2.4. There appears to be very little international will to sustain the effort in Afghanistan over the long-term and therefore if any Afghan institutions are to survive the transition they must be resilient and self-sustaining. 2.5. I believe for the transition in Afghanistan to have any chance of being sustainable we must now focus on three key areas; the first is the economy, the second is the educated elite - who have been working for us - and the third is the geographical areas where the Taliban are least powerful. 2.6. This is the who, what and where of my proposed strategy. 2.7. The intent is to create Ink Spots of Success which once established will spread and replicate in the areas where they have the best chance to grow. 2.8. We need to have a holistic view of the entire nation of Afghanistan and the factors that will deliver ultimate victory. By making the Taliban the focus of our main economic and military resources we have given them the initiative and allowed ourselves to fight them on their terms on their ground. Our uniformed forces operate out of fixed patrol bases amongst a wary population, which the Taliban blend into. Consequently the battle and maybe war winning advantage that we had in 2001 has been lost, in fact given, to our adversaries. Our military and economic superiority has been turned against us and the high cost of operations is strategically more damaging than the Taliban themselves. 2.9. I would propose using the ongoing but reducing conventional military operations as a strategic feint designed to tie up, expend, degrade and most importantly contain the Taliban. At the same time discretely switching our strategic main effort to the areas where the Taliban will be at a strategic disadvantage. This means focusing our main effort on our friends in the most permissive parts of Afghanistan to build a new Afghan economy, ideology and power-base that will be the antithesis and nemesis of the Taliban. 2.10. This approach will deliver a better and more tangible return on investment and demonstrate most clearly to the Afghan and our own public that rapid progress is being made and normalisation is under way. 2.11. If we cannot build a tangible success that will survive the transition then the credibility of the US and its partners and NATO will be significantly diminished. Also the Islamists will claim the Afghan Mujaheddin have not only defeated but been the major cause of decline of both the World’s Super Powers thus vindicating Osama Bin Laden’s strategy. 3.1. In 2002 I was on my first tour of Afghanistan as a soldier in the British Army. We employed five interpreters at the base; they were two engineers, a medical student, a trainee surgeon and a professor from the University. 3.2. As more international organisations arrived they employed more of Afghanistan's most educated elite. We effectively stripped Afghan institutions of their most critical staff and made it impossible for Afghan businesses and government institutions to compete with the wages we were willing to pay. 3.3. 10 years on there's a whole generation of progressive, moderate Afghans who view working for the international community as a viable career. As spending in Afghanistan draws down thousands of them are losing their jobs. They are faced with some very stark choices; either they will have to accept up to an 80% wage cut in the real Afghan economy, or they will emigrate, or they will become engaged in nefarious activities, or they will become a new powerful voice of discontent. 3.4. An entire generation of highly educated, moderate Afghans whose expectations we have raised will be tossed aside and left to their fate. Currently there is still a sense of denial that the international community is going home and taking our money with us. But very soon that denial will turn to anger if we don't, as a matter of urgency, help these young men and women, who have taken huge risks to work for us, to build for themselves a hopeful future to fight for. 3.5. This is a relatively straightforward thing to do. We know exactly who they are and we know exactly how to communicate with them. With relative ease we can help them build a positive vision for the future of Afghanistan and commit the appropriate resources to help them realise it. 3.6. The Taliban have absolutely nothing to offer these people. They are interested in a unique modern Islamic Afghan lifestyle full of personal development and new freedoms. If the Taliban ever did return to power they would deny these ambitious men and women everything they care about and probably kill a large number of them. 3.7. This gives these elite Afghans a very real reason to fight the Taliban and make sure they never return. However they currently don't have any power. They don't trust the government and they are starting to mistrust us because we are going home. 3.8. They need to be empowered and enabled to discuss, articulate and communicate their own positive vision for Afghanistan in 2018 and beyond and then helped to gain the resources to achieve it. We need to recognize that counter insurgency is a battle of ideologies and that currently our side doesn't have one, only policy. 3.9. Right now if you talk to these young men and women about their positive vision of the future it is inevitably of leaving Afghanistan and starting a new life, ideally in the West. If Afghanistan's most educated, most moderate and most experienced elite leave so will all hope for the future. 3.10. For too long we have made them help us implement our policy for Afghanistan. Now it's time for us to help them implement their vision for Afghanistan. They are a movement in waiting and it is time for us to empower them. 4.1. The elephant in the room in Afghanistan is the economy and it is only now that we're starting to talk about it. Currently the economy is made up of two things; opium and international spending. As international money draws down the only real economic opportunity that most businessmen will have is investing in opium. 4.2. The current cornerstone of our exit strategy in Afghanistan is the building of the Afghan National Security Forces. However without an economy there will be no tax base to pay for them and therefore they will not be the Afghan National Security Forces but ours and the insurgents will be able to use this as a rationale for continuing their violence. Further it is only a matter of time until the international commitment for paying for the Afghan National Security Forces wanes. 4.3. Conversely opium is a multi-billion dollar business that is taxed by the insurgents and provides a sustainable source of funding for their campaign of violence. As international spending continues to draw down so too will the licit economic opportunities for Afghanistan's business and political leaders and therefore they will be tempted to return to investing in opium which increases instability and corruption. We are already seeing signs of renewed poppy planting in the north of the country which could signal the return of Northern Alliance commanders to their bad old ways. 4.4. Huge amounts of money have been spent on economic development initiatives in Afghanistan. However the international community's spending has increased the cost of skilled personnel, real estate, goods and services and built a false, unsustainable economy that has seriously undermined real Afghan businesses. 4.5. Most of the economic development money has been spent on helping the Afghans make more of what they can produce not what they can sell. If there is no market we are unfairly raising expectations and creating huge disappointment as more and more Afghans become skilled in areas where there are no long-term prospects. 4.6. There is a patronising view that Afghans do not know how to run vertically integrated businesses or establish value chains. However the opium industry demonstrates that the Afghans are very capable of establishing complex vertically integrated supply chains to meet international demand for a product. 4.7. What is needed is new international demand for licit Afghan goods and services. 4.8. One of the fundamental problems we have created is that we have provided plenty of short-term ways for international and Afghan businessmen to generate huge amounts of profit but we have not generated long-term incentives to invest in the country. Currently most of the money that is made in Afghanistan is invested abroad and there are plenty of media reports of Afghan businessmen fleeing the country with suitcases full of money. 4.9. What we need to do as a matter of extreme urgency is to rapidly build reasons to invest in Afghanistan and create a real sustainable Afghan economy. This won't be easy because Afghanistan is a landlocked country surrounded by neighbours with a vested interest in keeping the centre weak. And let us be sensible and realistic about encouraging investment; no one is going to invest in the most dangerous parts of the country so let's focus our efforts where we have the best chance of success. 5.1. The international community has been committing the vast majority of its resources to the parts of Afghanistan that are the most violent and where the insurgency is strongest. 5.2. We provide huge contracts for construction, security, and logistics companies owned by Afghanistan's politicians and business leaders to support our counterinsurgency efforts in the south and east of the country. This provides them with a perverse incentive to ensure that the insurgency continues. There is no financial incentive for them to support the peace. 5.3. A U.S. Congress report found that insurgents, criminals and warlords were getting huge payouts indirectly from the US military via local companies who are paid to provide logistic support to US military bases. The local companies pay the insurgents and criminals not to attack their convoys. The report also provided evidence that a lot of attacks attributed to the Taliban are actually turf battles between the various stakeholders in the US supply line racket. Therefore the more we spend on counterinsurgency in the south and east the more money and incentives we give to the insurgents and criminals to continue their violence. 5.4. There is also a financial incentive for the local people to embrace the insurgency. We are focusing the vast majority of our development budget on the areas where the insurgency is strongest in an attempt to win the hearts and minds of the local people away from the insurgents. Therefore it is the areas where there is the most violence that get the roads the schools and the development projects. 5.5. I have spoken to a number of consultants and development workers working in the most peaceful areas of Afghanistan such as Bamiyan and Badakhshan who report that the local people are asking if they should start blowing things up so they can get money for schools, irrigation and hydroelectric. 5.6. We are in effect saying to the Afghan people if you allow insurgency in your area you will get development funding, if you reject insurgency and live in peace you get almost nothing. 5.7. I believe that the counterinsurgency ink spot strategy is the best approach but I believe that we should stop pouring our ink into the fires of Helmand, Kunar and Kandahar where it evaporates and begin to start dropping it into the areas where it is most likely to spread. 5.8. This means committing more of our strategic resources to areas such as Herat, Mazar and Bamiyan so that we can rapidly build and grow strategic Ink Spots of Success. With this approach we can create large zones of peace and economic growth that will first contain and then encroach upon the insurgency. 5.9. Our current strategy of trying to defeat the insurgency in the south is like smashing a military fist into the insurgent jelly. The harder we pound the more the jelly spreads into areas previously unaffected. Whilst it may take us millions of dollars and thousands of troops to retake an area like Marjah, a dozen Taliban can ride into a village in the north of the country on motorbikes and bring the villagers under their control in a matter of minutes. There was almost no insurgency in the north before NATO went to secure the south. 5.10. With the Ink Spots of Success approach we begin to deny large areas of the country to the insurgents by providing local people with the motivation and resources to repel them. By placing these Ink Spots strategically we can cut-off insurgent supply lines until the insurgency can be contained in isolated pockets which can be managed by a limited number of troops. 5.11. We also move the media narrative from war to rebuilding and sustainable growth. 5.12. The Hindu Kush mountains are a formidable natural barrier, by concentrating our efforts in strategic areas we could create the conditions where we could deny all of the north of Afghanistan to the insurgents. There are only half a dozen or so ways over or round the Hindu Kush, if we can deny these to the insurgents we can cut-off and suffocate the pockets of insurgency in northern Afghanistan. The fact that the Taliban has been able to gain a foothold in the north amongst the people that gave their lives and limbs to defeat them in 2001 is a terrible travesty and shows how badly our former allies have been let down. 5.13. If we can create major Ink Spots of Success at Herat and Mazar-e Sharif we could create a single zone of peace and prosperity that covers the entire west and north-west of Afghanistan. If we create Ink Spots at Takhar and Faizabad and along the route through the Salang Tunnel we can isolate and suffocate the insurgency in Kunduz and turn the entire north of the country into an area of peace and prosperity. The north of the country is where the normalisation of Afghanistan can begin and an area that can provide the tax base required to sustain the Afghan National Security Forces. 6.1. The actual strategy for how to implement the Ink Spots of Success concept is beyond the scope of this document. However the overarching principle is from Sun Tzu; "Reinforce success and starve failure." We need to starve the insurgents of the ideological, material and financial resources they need whilst nurturing and reinforcing the power of a new successful Afghan ideology. This should be achieved with a lightness of touch by the international community to ensure the successes are truly Afghan and truly sustainable. · Business & Communications Hubs – each Ink Spot has at least one Business Centre with fast internet, good business consultants and media resources to connect local businesses with national and international opportunities. · Air Bridges – dovetailed subsidies should be provided for national and international air cargo to connect Afghan producers with their markets. · Marketing & Public Relations – I have identified over 170 shops in the UK alone that sell Oriental carpets, most sell Afghan carpets. It would be relatively simple to increase the overall sector and the market share for Afghan carpets through public relations and point of sale promotions. E.g. Vogue magazine runs a front page story of Angelina Jolie visiting an Afghan women's carpet weaving business then showing off the rugs at home. The same could be done for other sectors especially fruit for the Indian middle class market. · Personal Development – some of the best personal development and business books translated into Dari and Pashtu and made available as audio files under licence. · Strategic Communications – sponsoring of new business, lifestyle and personal development shows on TV and radio and new online resources to reach the 1 million Afghan internet users who are our target market. · Infrastructure Building – provide Afghan businessmen with contracts to build appropriate infrastructure within the Ink Spots of Success – e.g. micro-hydroelectric or irrigation – using their own money as capital. Once the project is complete they are paid a fee which includes significant profit. These scheme will encourage businessmen to keep reinvesting profit back into Afghanistan rather than taking it to Dubai. · Military Operations – Afghan Special Forces to cut off insurgent supply routes to the north and take high value targets. Afghan Commandos to clear the insurgent strongholds in Konduz. Afghan conventional forces to hold key terrain south and east of Kabul and south of Herat. 6.3. In conclusion I believe a tangible, recognised and sustainable success in Afghanistan is still achievable but only by focusing remaining resources on a Smart Power strategy will we be able to achieve it at an acceptable cost. 6.4. I would welcome any opportunity to further develop this or similar Smart Power approaches to complex interventions. David James served on two tours of Afghanistan as a military intelligence operator being awarded the QCVS for the second. In 2005 he left the army to work in defence procurement with a personal remit to help improve the way the army managed information and retained knowledge from one short tour to the next. In 2008 he recognized that the strategic situation in Afghanistan was on a course to fail and that his work in defence procurement would not deliver results fast enough to improve the situation. David subsequently moved out to the Wakhan Corridor in the Afghan Hindu Kush mountains with his wife and young family to live amongst the local people. The intent was to create a single Ink Spot of Success that could act as an example for the international community and Afghan people to replicate. This work was highly successful but was curtailed by the US troop surge in 2010 which pushed the insurgents into previously peaceful areas of Afghanistan and made his work in promoting the most peaceful area of Afghanistan as a viable destination for experienced trekking and mountaineering expeditions untenable. He can be reached at his LinkedIn Profile.